We are a leading Manufacturer of miniature wheel brushes, wooden hub brushes, diamond powder and end brushes from Mumbai, India. 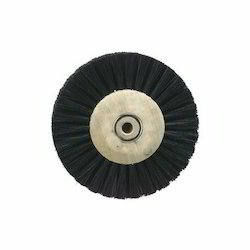 We feel immensely pleased to offer an extensive gamut of Miniature Wheel Brushes which is for cleaning and polishing the hard-to-reach places, these wheel brushes are provided in different colors as per their hardness like black for hard, black & brown for medium hard, and white for medium soft. These wheel brushes are provided to our customers at affordable rates. We are high on demand in the market for offering Wooden Hub Brushes. These hub brushes are provided in single, double, and triple row bristle as per the needs of customers. Our hub brushes are manufactured using optimum chungking bristle and a hard maple wood hub which ensures durability and reliability. 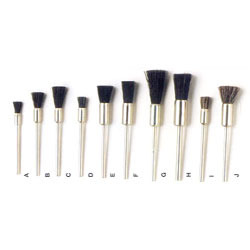 These hub brushes are checked from our end so as to deliver a flawless range. We are a prominent manufacturer, trader, and supplier of a wide assortment of Diamond Powder Paste. Our Diamond Powder Paste are suitable for various applications and latest technology in the production process. 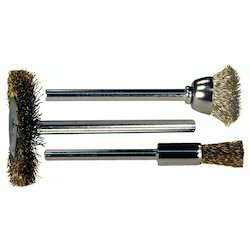 As a reputed organization, we are aimed at presenting a distinguished array of End Brushes which has maximum operating speed of 25,000 RPM & used for polishing hard to get at areas, these end brushes are manufactured with top grade of material and contemporary technologies, in adherence with market standards. Our offered end brushes are provided in various customized forms as per the divergent needs of our customers at the most affordable rates.